There are many others I saved for myself, but there are also a great many in my Etsy shop if you'd like to check them out. I certainly think it's a fun way to dress up a dinner table! It's Rural Thursday, so time for you to link up with Nancy from A Rural Journal and myself with your tales of the country life. Do you have a collection too? We want to hear about it. Or tell us about your gardening adventures, spring flowers, or hunting for eggs. Just grab the code below the button and paste it into your blog. Then come back to link up to your url. Don't forget to please visit the blogs of at least 5 others who participate, and leave them some comment love! These are just adorable, I have a hard time choosing a favorite. I want to collect everything I like, guess I'm a born collector. I have a collection of little boxes right now, that I've had forever. 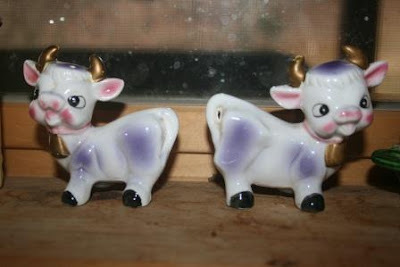 I love the purple cows! 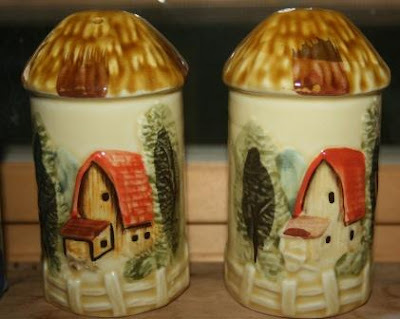 My maternal grandmother collected salt and pepper shakers. They lined shelves in her living room. After she died, they were divided amongst her 10 children and numerous grandchildren. I have a pretty little set with pink flowers. Sounds like a fun collections! Hey, my MIL had the little cows. They are my favorite! Those remind me of ones my grandmother had. She collected things like that including plates. She always brought back keepsake items from each of their vacations. 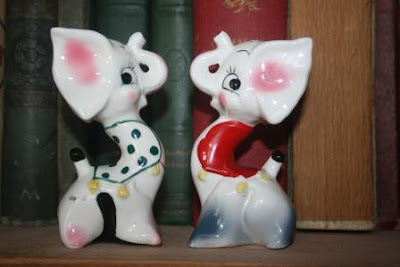 What cute salt and pepper shakers your Grandma had. My Hubs has been buying the ones with batteries that grinds chunks of salt and pepper. I think I have 3 different sets with batteries. 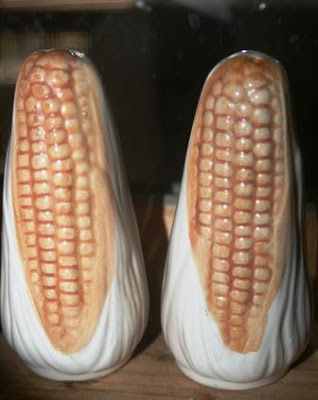 My grandma also collected salt and pepper shakers. I wish I had kept them. Yours are all adorable. this is a very beautiful collection of salt and pepper shakers. These are adorable! Especially love the happy purple cows. Great start on your collection! I love the farm scene shakers- but all are so cute!! All of those shakers are great! I especially like the little cottages. Those are great ! I wouldn't have been able to sell them either! trying to figure out the "blog hop" thing...so, when you say, "Then come back to link up to your url," you mean come back to your blog? then do what? Those are fantastic! What a collection. How awesome! Going to go check them out on your Etsy page. 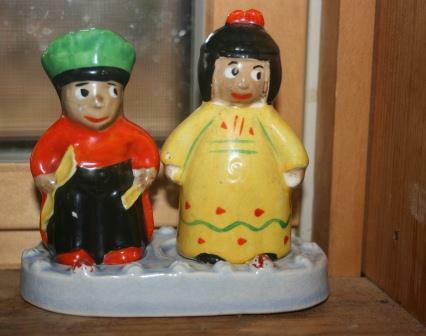 I have an aunt that collected salt and pepper shakers when I was a kid. She had an entire cabinet for them and it was just chock full of the things... Fun stuff. 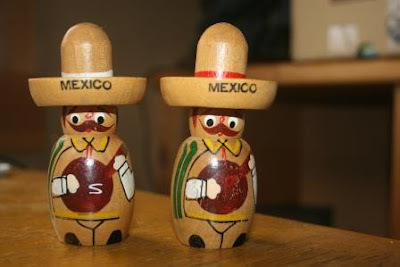 Oh wow, I do collect salt and pepper shakers and I would add these to my collection. They are so vintage! I do collect S&P shakers and these are really cute ones. Those would be so simple to collect...and probably addicting too huh?!? I'll have to check you Etsy store. I found a pair of horses once but gave them to a friend. I once had a salt & pepper collection that my dad initiated for me. It was fun. Yours are really sweet. so cute and vintage. i can see why you kept them!! They're all so whimsical and delightful! SO precious! Yup, looks like a new collection/collector has been formed! Thanks for hosting! That is such a cool collection! I've just started acquiring cute s & p shakers lately--I'm addicted. My favorite is my two peas in a pod that my husband got for free from someone at work. Dang, they are cute. They are so cute! 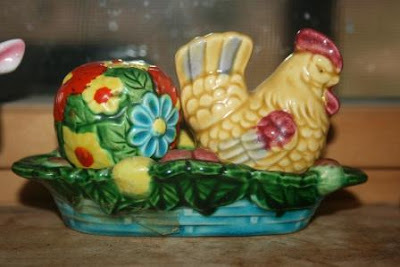 My grandmother collected salt and pepper shakers too! Your new collection of salt and pepper shakers are so cute! I've been noticing those s&p's in your etsy widget -- so cute! I would not have been able to let go of any of them. Great collection, Lisa! I love those! My grandma collected salt and pepper shakers, and was so proud of them. She passed away 12 years ago, and over the summer, my family finally got together to go through her collection. I left with many treasures!